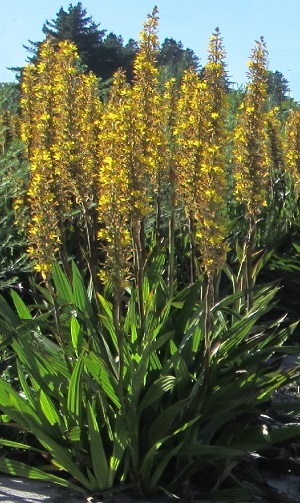 A dramatic Cape Flora waterside plant with clumps of sword-shaped leaves and tall spikes of lovely yellow flowers in summer. Leaves up to 1m tall and flower spikes up to 2.5m tall. Plants prefer wet conditions in full or partial sun, but they can also grow in the garden with plenty of water. They will tolerate frost to -1°C and up to -7°C with protection, and are perhaps hardier than expected as they grow in warmer western UK gardens under the influence of the gulf stream. Plants look great in a garden with Aristea major and nicely combined with Arum Lily (Zantedeschia aethiopica) on a waterside position. Flowering from the third or fourth season – it takes time and effort, but is worth it. Pack of 15 seeds. Sow in spring or autumn. Sowing instructions and a colour photo are printed on the label. Sow in spring or autumn. Sow seeds in deep trays (eg 10cm) or small pots of moist seed compost. Gently chipping some seeds with a scalpel before sowing can improve germination. Keep at 18-21 °C, and germination takes 4-6 weeks, sometimes longer. Transplant seedlings into the garden in the third season. Flowering begins in the third or fourth season. This is a half hardy plant that likes moist conditions, and can be planted in up to 10cm of water. Plants are evergreen and should be tidied up after flowering and as necessary. Mature clumbs can be divided at the rhizomes in summer/autumn after flowering.